Prepare for the ULTIMATE Block Parties! Let’s play! Children have uttered those words forever and a day. Play is their work and the urge to play comes naturally. Yet with the rising consumption of media, the absence of recess in schools, and many other societal factors, children today play less and less. The Ultimate Block Party was conceived as a movement to bring play back to the fore in the education debate and to inform parents, caregivers, and educators about the science behind play—science that shows the importance of play in healthy growth and development. 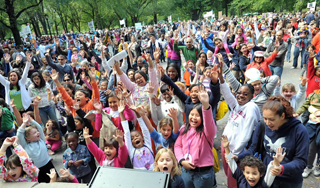 The goal of the inaugural Ultimate Block Party in New York City was to invite children and their families and educators to an event that showcased many ways of playing and importantly, many ways of learning. 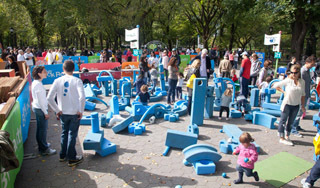 Each participating activity featured a learning goal, achieved through play—such as applying creativity, imagination and spatial skills while playing at Imagination Playground™ (top left). Supporting the effort were "Play Doctors," real-life scientists who, wearing colorful lab coats, roamed the play area talking with parents and caregivers about the science behind the play. 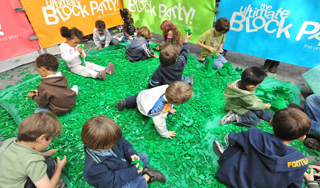 In addition, each person attending the Block Party received the Ultimate Block Party PlayBook—a colorful, information-rich book about play and learning that included ideas for furthering the play at home, resources for more learning about play, and much, much more. And the play continues! Many cities across the country and even around the world have expressed interest in hosting Ultimate Block Parties of their own. Toronto is hosting its first ever Ultimate Block Party in Fort York on Sunday, June 5. Baltimore will follow in the fall on October 2nd at Rash Field. 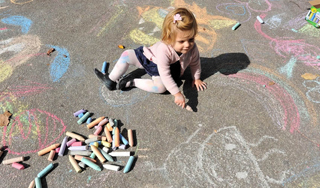 Both events will embrace play with a wide range of activities, each of which support and nurture a child’s healthy growth, development and learning. Visit the Ultimate Block Party at www.ultimateblockparty.org for a copy of the PlayBook and for additional resources and information. A new web portal for parents and educators called the Learning Resource Network, or L_rn, will assemble and consolidate in one place research and best practices in child development, cognitive neuroscience, education, public health, parent engagement and more to spark conversations and connections in learning at home, in schools, in communities and around the world. Look for the L_rn launch later this year on September 14.